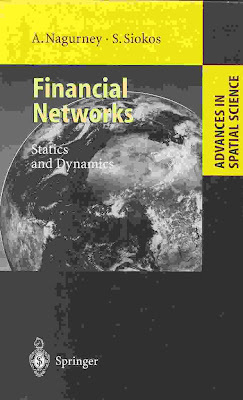 In 1997, I co-authored with Dr. Stavros Siokos, the book, Financial Networks: Statics and Dynamics, and financial networks are very hot now as both a topic in research and practice due to the financial crisis. Dr. Siokos had been one of my doctoral students, and I had chaired his dissertation in Operations Research. I am a faculty member in the Isenberg School but have also supervised several doctoral dissertations in the College of Engineering, since I hold courtesy appointments in two departments there. Dr. Siokos is originally from Greece and he needed to complete his dissertation in the College of Engineering at UMass Amherst (rather than in Management Science) in order not to serve in the Greek army. The title of his dissertation was: International multi-sector, multi-instrument financial modeling and computation: Statics and dynamics, Department of Industrial Engineering and Operations Research, University of Massachusetts Amherst, 1998. Together we had co-authored papers which had appeared in such journals as Networks and Annals of Operations Research. He has had a meteoric career in finance and serves as a Center Associate of the Virtual Center for Supernetworks that I direct at the Isenberg School of Management. Dr. Siokos has now been appointed President of Sciens Fund of Hedge Funds Management (which is a fund of funds) and had previously served as a non-executive member of Sciens. This reminds me of supernetwoks, which are "networks of networks." Dr. Siokos served for many years as the Managing Director within the equities division of Citigroup in London, where he was Global Head of Alternative Execution Sales (program trading, algorithmic trading, Direct Market Access), Global Head of portfolio trading strategies as well as head of the company's pension funds and insurance companies equity structured solutions in Europe. He, since April 2008, until now, was the Deputy General Manager & Head of Asset management, Private Banking, Private Equity & Alternative Investments of Piraeus Bank in Athens, Greece. He has been top ranked in most of the major European Investment and Alternative Execution surveys in the quantitative services sector over the last nine years. Several of my former doctoral students have achieved the rank of Full Professor as academics and I can now say that a former doctoral student of mine is now a President! I could not be prouder and like to think that it is the methodologies that he learned and advanced in operations research and the management sciences that have enabled him to flourish in financial services at the global level and to be responsible for a fund worth billions of dollars. The SBP 2011 Tutorial Presentations Are Now Online! If you missed the three excellent tutorials that were delivered this past Monday, as part of the Social Computing, Behavioral-Cultural Modeling, and Prediction (SBP) 2011 Conference at the University of Maryland College Park, you may access the presentations online! The above photos were taken at these tutorials. Thanks again to the outstanding presenters and to the audiences for the great questions and discussions! Also, thanks to the tutorial presenters for making their lecture slides available! This blog post is being written as part of the monthly INFORMS blog challenge with the March challenge being "O.R. and Sports." 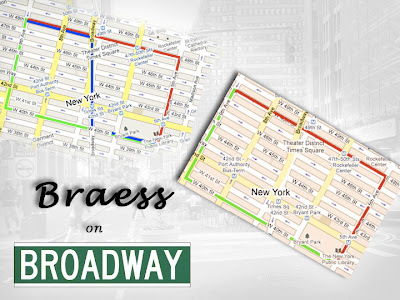 On March 15, 2011, after many discussions with a Public Broadcasting System (PBS) TV team about transportation, I ended up on Broadway in NYC for an interview and filming. A high level "script" had been prepared, which addressed not only a broad sweep of transportation and policies to alleviate congestion dating back to ancient times, but also more recent policies in Mayor Bloomberg's administration, including the removal of roads to traffic and the creation of pedestrian plazas as on Broadway from 47th Street to 42nd Street (see photos above). 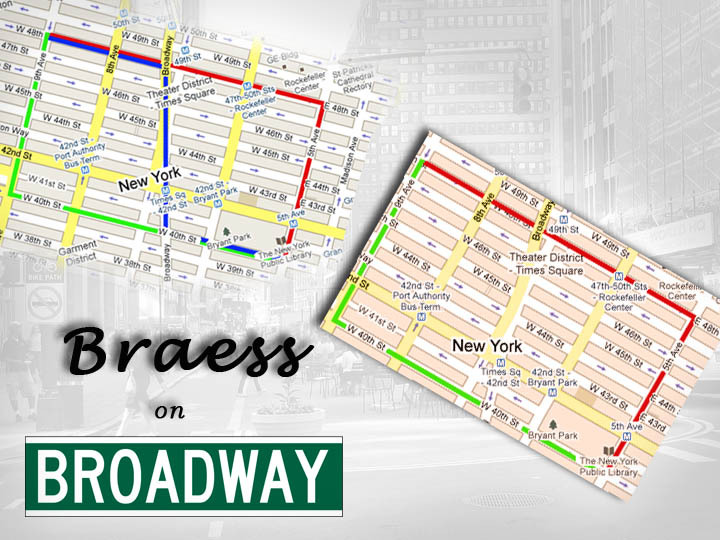 The script also included the meaning and importance of the Braess paradox, its relevance to the NYC transportation policies, and how this paradox continues to fascinate. I was being interviewed and filmed for the PBS TV series: America Revealed, which will have segments on transportation, energy, and food, along with additional online video clips. A few days before the video taping on Broadway, I was asked whether I could also comment on the relevance of the Braess paradox to basketball! Of course, it was March Madness time, and, although my interview will not be airing until next Fall, since this PBS production is an educational one, it is important to engage the audience, which is expected to include students from middle school, high school, and beyond, as well as the interested public, on related topics that might interest them. To add to the excitement, at the lunch with the producer before the filming was to take place, I was told that my interviewer was Yul Kwon, the winner of the TV reality show, Survivor, in 2006. As I noted in an earlier post, he attributed his winning of the million dollar prize to his knowledge of game theory. He has degrees from Stanford and Yale, and was fantastic. Now back to what the Braess paradox may have to do with the sport of basketball. Recall that in the classical Braess paradox example, the addition of a new link to a transportation network, in the case of user-optimizing (selfish behavior), resulted in an increase in the travel time (cost) for all travelers in the network. Hence, in certain networks, the removal (or closure) of a road can actually improve travel time. In the basketball world, according to Bill Simmons of ESPN, there is the Ewing Theory. According to Simmons: The theory was created in the mid-'90s by Dave Cirilli, a friend of his who was convinced that Patrick Ewing's teams (both at Georgetown and with New York) inexplicably played better when Ewing was either injured or missing extended stretches because of foul trouble. Simmons has a primer, Ewings Theory 101, which lists examples in basketball history where the removal of a top player (paradoxically) results in a better outcome for the basketball team. Brian Skinner, a physicist at the University of Minnesota, wrote an article, "The Price of Anarchy in Basketball" in which he developed an analogy, through a model, between certain basketball plays and the Braess paradox, in order to further explore the Ewing Theory. You may find the preprint of the article here. You can also read a discussion of the specific play(s) on Skinner's blog. How nice to be able to talk about game theory, the Braess paradox, and the relevance to even basketball, on Broadway, and to also get a chance to promote O.R.! The original Braess article was written in German, and, due to popular demand, Professor Braess, Dr. Tina Wakolbinger (who was then my doctoral student at the Isenberg School), and I did a translation of it to English, which was published in the INFORMS journal, Transportation Science in 2005! Below is a photo of Professor Dietrich Braess with Tina and me in the Supernetworks Lab at the Isenberg School with the translation. Professor Dietrich Braess visited us in April 2006 and also spoke in our Speaker Series. Coincidentally, Tina, after receiving her PhD at UMass Amherst, joined the faculty of the University of Memphis, and when I gave talks there, I had the pleasure of meeting also with Coach John Calipari (Coach "Cal" had been the men's basketball coach at UMass Amherst in the 1990s and we have mutual friends). He is now Kentucky's men's basketball coach and his team, along with UCONN's, VCU's and Butler's have made it to the 2011 Men's Basketball NCAA Final Four! Note the photo below with Coach Cal in his Memphis office back in the Fall of 2008 where he had a lot of UMass Amherst memorabilia. In fact, one of his daughters graduated from UMass and another one is still a student here. As for Dr. Tina Wakolbinger, she will be joining the faculty of the Vienna University of Economics and Business as a Full Professor on May 15, 2011, and she received her PhD in 2007! It will certainly be interesting to see who wins the 2011 NCAA basketball championship (both men's and women's)! The SBP 2011 conference has been a huge success from the outstanding tutorials and great keynotes, as well as paper presentations (with a refereed proceedings volume), plus social activities. One of the absolute highlights was sponsorship of 30 students to attend this conference! Many, many thanks to the sponsors: NSF, NIH, ONR. AFOSR, and ARO for bringing together computer scientists, social scientists from economists to anthropologists, operations researchers and management scientists, applied mathematicians, biologists, medical professionals, cognitive scientists and psychologists, as well as engineers and network scientists! Special thanks to the Conference Co-chairs, Professor Dana Nau of the University of Maryland and Professor Sun-ki Chai of the University of Hawaii, and to the Program Co-Chairs: John Salerno of the Air Force Research Lab and Professor Jay Yang of the Rochester Institute of Technology for such an excellently organized conference, the terrific venue, and so many stimulating discussions plus such a delicious set of lunches and coffee breaks! It was an honor to be on this team as the tutorial chair! Would Proper Risk Assessment and Management Have Minimized the Damage to Japan? The New York Times in a provocative article is raising the question of whether attention to risk assessment for nuclear power plants in Japan might have reduced the scale of the damage from the triple earthquake-tsunami-nuclear disaster. The article even highlights that Japanese engineers focused on deterministic as opposed to probabilistic approaches in determining the safety of the associated engineering structures. According to the article, over the decades, preparedness against tsunamis never became a priority for Japan’s power companies or nuclear regulators. They were perhaps lulled, experts said, by the fact that no tsunami (itself a Japanese word) had struck a nuclear plant until two weeks ago. Even though tsunami simulations offered new ways to assess the risks of tsunamis, plant operators made few changes at their aging facilities, and nuclear regulators did not press them. Also, engineers took a similar approach with earthquakes. According to Masaru Kobayashi, an expert on quake resistance at the Nuclear and Industrial Safety Agency, Japan’s nuclear regulator, "When it came to designing the Fukushima plant, official records dating from 1600 showed that the strongest earthquakes off the coast of present-day Fukushima Prefecture had registered between magnitude 7.0 and 8.0." We all know that the earthquake that struck Japan on March 11, 2011, has now been upgraded from an 8.9 earthquake to a 9.0 one. The Times article stated: For whatever reasons — whether cultural, historical or simply financial — Japanese engineers working on nuclear plants continued to predict what they believed were maximum earthquakes based on records. Those methods, however, did not take into account serious uncertainties such as faults that had not been discovered or earthquakes that were gigantic but rare, said Greg Hardy, a US-based structural engineer. Indeed, in the West, risk management and assessment has become a focus not only of engineering studies and analyses but also a critical component of business decision-making. Drawn from techniques in finance, probability, and, I would add, optimization and decision-making under uncertainty, risk management has been integrated with design and analysis with a notable body of literature now in existence especially in the area of global supply chains (clearly also impacted by the Japanese set of disasters). Anna Nagurney, Jose Cruz, June Dong, and Ding Zhang, European Journal of Operational Research 26: (2005) pp 120-142. June Dong, Ding Zhang, Hong Yan, and Anna Nagurney, Annals of Operations Research 135: (2005) pp 155-178. Anna Nagurney and Dmytro Matsypura, Transportation Research E 41: (2005) pp 585-612. Anna Nagurney and Ke Ke, European Journal of Operational Research 172: (2006) pp 40-63. Qiang Qiang, Anna Nagurney, and June Dong, in Managing Supply Chain Risk and Vulnerability: Tools and Methods for Supply Chain Decision Makers, T. Wu and J. Blackhurst, Editors, Springer, Berlin, Germany (2009) pp 91-111. Zugang Liu and Anna Nagurney, Omega 39: (2011) pp 539-549. Zugang Liu and Anna Nagurney, to appear in the Journal of Financial Decision Making. Anna Nagurney, Min Yu, and Qiang Qiang, Papers in Regional Science 90: (2011) pp 123-142. Only with the right methodological and analytical tools can we assess risk and prepare appropriately for emergencies and disasters! Hope to See You at the Northeast Regional INFORMS Conference at UMass Amherst! The program with schedule for the First Northeast Regional INFORMS Conference, which will take place at UMass Amherst, May 6-7, 2011 is now searchable online! Feel free to search for your favorite "key word" to see the list of exciting presentations. With three outstanding plenary speakers: Dr. Brenda Dietriich of IBM, Dr. Alex "Sandy" Pentland of the Media Lab at MIT, and Dr. Simchi-Levi of MIT, plus two terrific tutorials: by Greg H. Parlier and Tom Donnelly, and three panels: The Academic Job Search Process, Research in Academia and Industry, and How to Run a Successful INFORMS Student Chapter, and with dozens of invited and contributed sessions with papers on topics ranging from supply chains to health care and even social networks, it will be a very exciting and informative conference. The early registration deadline is April 8, 2011. The Conference Committee has worked very hard to provide an excellent set of presentations as well as social events. We acknowledge financial support from the Isenberg School of Management, the College of Engineering at UMass Amherst as well as from the Vice Chancellor for Research and Engagement at UMass Amherst! Also, special thanks go to the INFORMS folks who have been so wonderful in supporting the General Chair, Dr. Hari Balasubramanian, the Program Co-Chairs, Drs. Les Servi and Tamas Terlaky, and the Program Committee. We look forward to welcoming you to UMass Amherst in early May! 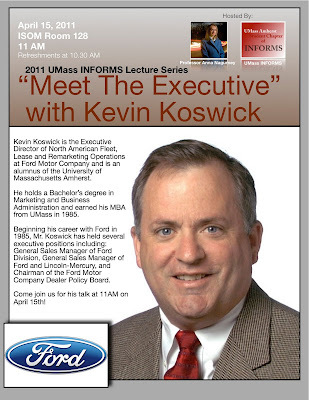 I am delighted that we will be hosting Mr. Kevin Koswick of Ford in our next "Meet the Executive" event at the Isenberg School of Management. 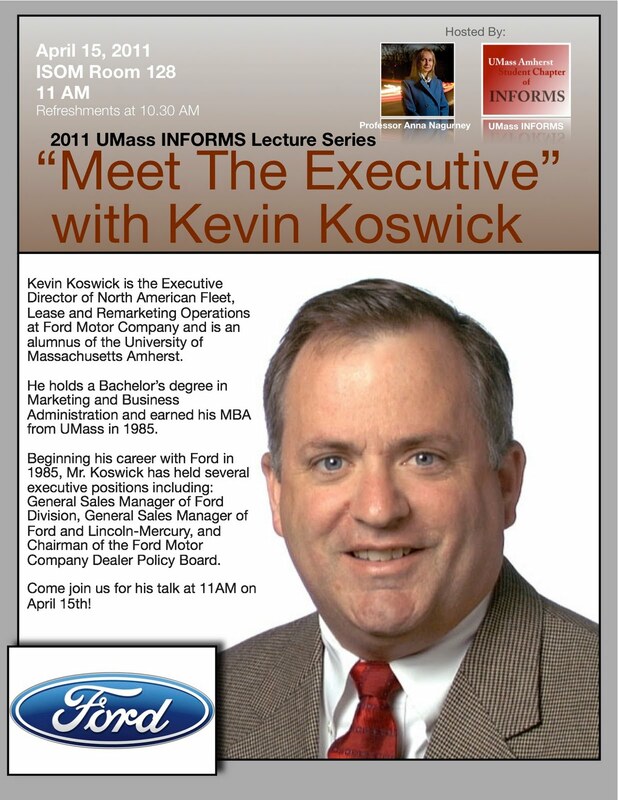 Mr. Koswick will be speaking on Friday, April 15, 2011 at 11AM in ISOM Room 128. This series is organized by the award-winning UMass Amherst INFORMS Student Chapter. Mr. Koswick is the Executive Director of North American Fleet, Lease and Remarketing Operations. In this role, Koswick oversees the largest commercial and government operation in the industry, as well the remarketing of all Ford Vehicles in North America. In addition, he has brand responsibilities for all Ford Commercial Vans, Chassis Cabs, Police Vehicles, Taxis, Limousines, Livery and Recreational Vehicles. Beginning his career with Ford Division in 1985 as a Sales Representative for the Philadelphia Region, Koswick has held several managerial roles in Ford Division, Marketing Sales and Service including Regional Market Representation Manager for the Northeast, National Contest & Incentive Coordinator, General Zone Manager for the Cincinnati Region, and Regional Marketing Manager for the Southwest Region --where he developed and implemented plans contributing to Ford’s truck leadership. In 1996, he became Regional Operations Manager for the New York Region, and in 1998 became Regional Sales Manager for Washington D.C. Region. Kevin was appointed Ford Division Manager of Commercial Trucks in 2001, a position he held prior to his appointment to the Executive level in the Ford Motor Company. Mr. Koswick has held several executive positions with Ford dating back to December 2002, including General Sales Manager of Ford Division, General Sales Manager of Ford and Lincoln-Mercury, and Chairman of the Ford Motor Company Dealer Policy Board. He was born in Washington DC, and raised in the New England. Koswick graduated in 1983 with a bachelor's degree in marketing and business administration from Western New England College in Springfield, Mass. He completed his MBA in 1985 at the University of Massachusetts Amherst. I love transportation and yesterday evening I took part in a very special banquet at UMass Amherst celebrating transportation! The banquet was the culmination of a full day of transportation-related events organized by the nationally-recognized UMass Amherst Institute for Transportation Engineers (ITE) Student Chapter and included not only research presentations but even a Jeopardy-like competition among student teams from New England universities known as the Traffic Bowl (UConn won). The banquet took place on the tenth floor of our Campus Center (see photos above). I had the distinct honor and privilege of being seated next to Peter H. Appel, the Administrator of the U.S. Department of Transportation Research and Innovative Technology Administration (RITA) in Washington, DC. His keynote speech was fantastic and at the dinner we were amazed at so many points of commonality between us from having spent time at MIT's Transportation Center to having a broad perspective on transportation and its importance to even having met one of the winners of Survivor, Yul Kwon, who had worked at the FCC, and who was my interviewer last week in NYC for a PBS production! In his speech, he emphasized the strategic goals for transportation, beginning with safety, and including economic growth, infrastructure maintenance, and environmental sustainability. He talked about breaking down stovepipes and silos among federal transportation organizations from the FAA to the Federal Highway Administration. Mr. Appel emphasized the importance of all modes of transportation and the need to optimize across modes. He spoke of harnessing waterways for transportation, which we had not full done so. He emphasized the role of optimization and the importance of operations research and maximizing investments in infrastructure and network design subject to limited constraints. He noted how different disciplines must work together to move transportation forward and how transportation will be an area of growing importance for the next coming decades. His speech was very entertaining and he highlighted how there are "train people" (he had begun his career with Amtrak) as well as "aviation" folks, who, typically, work for the FAA (he had done that, too). I am married to a train person and his collection of model trains graces his office, our basement, etc.! When I asked Mr. Appel what his favorite mode of transportation is, he answered "transportation!" Banquets at this time of the academic year begin the "award season," during which special recognitions are made. Last evening, students (past and present) were honored for their achievements and yours truly received the Jane F. Garvey Transportation Leadership Award. The award plaque was given to me by Mr. Appel (a double honor, I must say). I have written about Jane F. Garvey on this blog on several occasions and I will display the award in my Isenberg School of Management office so that my students can get inspiration from it. They are the ones who have made my life-long devotion to and fascination with transportation so intellectually enriching and so much fun! Thanks to the UMass Amherst ITE Chapter for such a great day and evening. I wish you much continuing success with all of your activities! Special thanks to the chapter's amazing Faculty Advisor, Professor Mike Knodler, who was the Master of Ceremonies last night, and to Professor John Collura, the senior statesman of transportation in our Department of Civil and Environmental Engineering, who had actually invited Mr. Appel to speak at the banquet at the Transportation Research Board meeting in DC this past January, which many of us attended. It was great to see other transportation faculty at this even, including Professors Song Gao and Daiheng Ni. Even Professor Nathan Gartner of UMass Lowell was there and I teach about some of his contributions in my classes! With the heart-breaking disasters in Japan, and the tremendous human and economic impacts, and, now, with the radiation spreading and various foods from the area surrounding the damaged Fukushima nuclear plant banned for consumption, plus even the water in Tokyo affected, I thought it time to step back and to reflect on nature. Interestingly, we are increasingly seeing calls for "robustness" and "resiliency" in the context of supply chains since so many from automobile to airline to high tech component ones, including chips, have been adversely affected and seriously disrupted, including the biggest auto manufacturing company in the world, Toyota, because of the triple earthquake-tsunami-nuclear plant disaster that hit Japan, beginning on March 11, 2011, a date that I have sealed in my memory. In addition, journalists are making analogies of supply chains to biological organisms and even the human body and noting how resilient such systems are. So what are the relationships between biological networks in nature and supply chains? If we can rigorously establish the connections, we should be able to learn how to design more resilient and robust systems, including supply chain networks. In a recent study, entitled, Dynamics and Equilibria of Ecological Predator-Prey Networks as Nature’s Supply Chains, that I co-authored with the "other" Professor Nagurney, we were able to establish the equivalence between predator-prey ecological networks (think of food chains, for example, as in fisheries, to start) and multitiered supply chains consisting of "agents" who are manufacturers, retailers, or consumers, respectively. What I found fascinating is that in "product" or, shall I say, "corporate" supply chains, one explicitly considers various decision-makers' objective functions, which tend to include the maximization of profits, at least for the manufacturers and the retailers. Moreover, the various decision-makers "compete," whereas in predator-prey ecological networks, competition is clear, but, until now, no-one really quantified prices or value in that context. In our paper, we established, using a dynamic model of predator prey interactions, that the stationary points or equilibria coincide precisely with those of the equilibria in supply chain networks! The general supply chain model that we used to show this equivalence, which was previously unexplored, was the supply chain network equilibrium model that I developed with Professors June Dong and Ding Zhang and which was published in Transportation Research E in 2002. That model has served as the foundation for numerous extensions; for just a few, click here. Shanghai, China, May 29-30, 2011, and it is in press in the Proceedings of that conference. We became interested in this area of research due to a truly original paper, entitled "NEATS: A Network Economics Approach to Trophic Systems," published in the journal Ecological Modelling, co-authored by a group of researchers based in France: Mullon, Shin, and Cury. The paper applies some of the results in my Network Economics: A Variational Inequality Approach book to formulate and determine equilibria in predator-prey complex webs. One reads regularly about the impact of science on economics but this paper demonstrates how economics and, especially, network economics, can be used to combine both biological constraints that couple biomass balance equations with complementarity principles using Walras' law. The authors investigate the solutions to simple food chains, bilayer networks, complex food webs, and even to cannibalism (the links loop back to the specific nodes in such networks)! In today's complex world, it takes a great team to move research and education forward. As the Director of the Virtual Center for Supernetworks, based at the Isenberg School of Management at UMass Amherst, I must say that I could not be prouder of my team than I am. In the past several days we have received all sorts of wonderful news. First, Center Associate Dr. Dmytro Matsypura of the University of Sydney in Australia will be recognized for his teaching and mentoring with the Wayne Lonergan Outstanding Teaching Award (Early Career) from the School of Business at the University of Sydney. Secondly, Center Associates Dr. Jose M. Cruz of the School of Business at the University of Connecticut and Dr. Zugang "Leo" Liu of Penn State Hazleton have had their paper, "Modeling and Analysis of Multiperiod Effects of Social Relationship on Supply Chain Networks," accepted for publication in the European Journal of Operational Research. Also, Dr. Liu's paper, "Risk Reducation and Cost Synergy in Mergers and Acquisitions via Supply Chain Network Integration," co-authored with me, has been accepted for publication in the Journal of Financial Decision Making. The latter paper follows our recent study, "Supply Chain Outsourcing Under Exchange Rate Risk and Competition," which appears in Omega 39 (2011) pp 539-549. Center Associate Dr. Tina Wakolbinger will begin her new position as a Full Professor of Supply Chain Services and Networks at the Vienna University of Economics and Business on May 15, 2011. Dr. Wakolbinger is the Editor of the WORMS (Women in Operations Research and the Management Sciences) newsletter, which just released its first edition. She will be leaving her faculty position at the Fogelman School of Business and Economics at the University of Memphis, where she has been the past almost three years. Also, Center Associate Dr. Patrick Qiang of the Graduate School of Professional Studies at Penn State Malvern has been accepted into the Emerging Scholars Program at the upcoming POMS meeting to be held in Reno, Nevada. All of the above faculty member Center Associates received their PhDs from the Isenberg School of Management with a concentration in Management Science. I had the distinct honor and privilege of serving as their dissertation advisor. Additional news about our present doctoral student Center Associates can be found in an earlier posting on this blog. How far does our critical infrastructure have to crumble before we will take concerted, systemic action? How many disasters do we have to observe and experience, from both near and far, before we move forward? How many opportunities will we continue to miss in moving our people and goods more efficiently, in cleaning up our air and waterways, and in building the schools and health care resources that our citizens need and deserve? How long do we wait before the latest research on network resiliency gets put into practice? How many more people need to lose their jobs before we, as a country, move forward in a significant, constructive, and measurable way? There is promise on the horizon. In an editorial, published in today's New York Times, there is bipartisan support, led by Senators John Kerry, Democrat of Massachusetts, Kay Bailey Hutchison, Republican of Texas, and Mark Warner, Democrat of Virginia, to establish an infrastructure bank. According to the editorial: The bank would lend money to build big-ticket transportation, water and energy projects that have a clear public benefit. The loans, or loan guarantees, would be designed to attract private capital as well. In fact, at least half a project’s financing would have to come from the private sector. As much as $640 billion could be leveraged this way over the next decade, proponents say. It is time for the United States of America to lead in creation of an economy through a critical infrastructure that is an example for all the world! And in doing so, let us take advantage of the latest research on network design, risk management, sustainability, through analytics, so that we repair what needs to be repaired; build what needs to be built and where, and create lasting jobs for a brighter and safer future for all! And remember, let's acknowledge system risk and financial networks, this time around! The New York Times has some very timely coverage of the immediate and more speculative impact on global supply chains post the earthquake-tsunami-nuclear set of disasters in Japan. The article, "Stress Test for the Global Supply Chain," begins with a very vivid account of an H.P. VP of Operations, Tony Prophet, being awaken at 3:30AM and then proceeding to triage, as in an emergency room, the potential impacts of this triple disaster on H.P. 's global supply chain. Mr. Prophet oversees all hardware purchasing for H.P.’s $65-billion-a-year global supply chain, which feeds its huge manufacturing engine. Its factories produce two personal computers a second, two printers a second and one data-center computer every 15 seconds. Japan, as the world's third largest economy, is a key supplier of automobile components (as well as automobiles), high tech products, including integrated chips, and even raw materials such as resins that are used in integrated circuit packaging. Factories that were affected by the triple disaster are shut down in Japan creating cascading failures across the globe with GM even closing one of its manufacturing plants in Louisiana. Not only has manufacturing been disrupted but with so many of the roads impassable, not to mention ports being damaged, the transportation of goods has come to a standstill in parts of Japan. Areas where there is radiation danger with radii of 20 miles to as far as 50 miles have taken on a moon landscape of inactivity since those who have not evacuated have been told to stay indoors. In 2009, we contributed the chapter, Modeling of Supply Chain Risk Under Disruptions with Performance Measurement and Robustness Analysis, co-authored with Professors Qiang Qiang and June Dong, to the book, Managing Supply Chain Risk and Vulnerability: Tools and Methods for Supply Chain Decision Makers, T. Wu and J. Blackhurst, Editors, Springer, Berlin, Germany (2009) pp 91-111. This study shows how to assess, a priori, a supply chain's vulnerability from a system and robustness perspective.The model formulation captures supply-side risk as well as demand-side risk, along with uncertainty in transportation and other costs. The model also incorporates the individual attitudes towards disruption risks among the manufacturers and the retailers, with the demands for the product associated with the retailers being random. We also proposed a weighted supply chain performance and robustness measure based on our recently derived network performance / efficiency measure and provide supply chain examples along with the robustness analyses. This work extends previous supply chain research by capturing supply-side disruption risks, transportation and other cost risks, and demand-side uncertainty within an integrated modeling and robustness analysis framework. Of course, it is not only complex corporate supply chains that are now being impacted but humanitarian ones have also been deeply affected since the radiation from the Fukushima nuclear power plant has limited the arrival of necessary supplies to those in need who have not been able to evacuate. Japan has a large elderly population and their suffering is horrific. Humanitarian supply chains are different from corporate ones, since the underlying objectives in managing each of them are clearly distinct. One cannot engage in profit-maximization in the case of humanitarian operations and time is often of the essence. Hence, to assess the performance of humanitarian supply chains, Professor Qiang and I have constructed, A Bi-Criteria Measure to Assess Supply Chain Network Performance for Critical Needs Under Capacity and Demand Disruptions. As researchers and scholars, we hope that we can assist, in a small but concrete way, through our work. As promised in my earlier post, above are photos from the Bement School alum trip back to the Dominican Republic to help out in La Suiza, which is a boys' orphanage. This was my daughter's second trip there, having been there originally as a ninth grader, two years ago. As you can see from the photos above, helping out at the orphanage and visiting the local school which girls also attend was transformative. The mural that the alums painted will be a lasting reminder of this service trip. Sad to say, though, the founder of La Suiza died a year ago and his daughter, who ran this orphanage suffered a stroke, so the support for this special place, which houses and feeds boys without any other homes, may not be sufficient to keep it going. The cook there is expecting her fifth child any day now which only complicates matters. At least for a week, the children received much love and attention from a very special group. There is talk about trying to start a nonprofit organization to provide the financial support that is sorely needed to make sure that the children there get the basics that they desperately need. The spirit of the children in the midst of poverty speaks of their endurance. Their trip coincided (with a one day delay) with the earthquake, tsunami, and nuclear disaster in Japan and now, after a week, they have all returned safely. The group, consisting of ten Bement School alums, accompanied by two of their former teachers, a spouse of one of them, and two medical professionals departed western Massachusetts on Saturday morning, March 12, 2011, at 5:30AM in the darkness. They returned this morning safely to their homes at about 2AM, having flown back from Santo Domingo to JFK and then ridden the Bement School van back to western Massachusetts. The group consisted of students who had been to La Suiza Orphanage in the Dominican Republic as part of their 9th grade Bement School curriculum and had since graduated. It was not certain that the trip would become a reality. As you know, the Dominican Republic shares an island with Haiti, which marked this past January the first anniversary of its devastating earthquake, followed by an outbreak of cholera months afterwards. As a parent of one of the travelers, and as someone who also does research on risk management from financial networks to supply chains, I felt a bit unsettled about the prospect of this trip. However, the joy that preceded this trip in the anticipation of seeing the boys (some are as young as 3 years old) and in planning various activities for them made me realize the significance of this return trip to all the participants. Yesterday evening, before boarding the plane that would bring them back to the US, my daughter left a voice mail message, saying that this trip was even better then her first trip there, which took place two years ago. That trip coincided with one of my first posts on this blog. As a teacher told us, the orphans were used to groups coming and then leaving (quite a few consisted of adults helping out with much-needed maintenance of the orphanage and school) but this was the first "school" group that had come back to see them and to be with them and they had done it because they really wanted to. The Bement School graduates on this trip consisted of students (all females, interestingly) who were now at high schools, including Deerfield Academy, Northfield Mount Hermon, Brewster Academy, and Suffield Academy, as well as Williston. They had graduated within a two year period from Bement. Above is a photo taken of the suitcase that my daughter packed up with activities for the children at La Suiza. I hope to share more on their experiences, plus photos, after the travelers have had some much-needed rest. Our hearts and prayers go out to the people of Japan for their tremendous pain, losses, and suffering. Please realize that, as global citizens of one world, you are in our thoughts as we all work for the recovery of your great nation. I have had the distinct honor of going to Japan several times and one of my PhD students was from Japan. The Bement School has also graduated several students from Japan. The date for the filming in NYC finally arrived -- March 15, 2011 but we were told that the part of Broadway where my interview was to take place was closed because of a setup for a major motion picture. No problem -- in scouting out the area, luckily, 42nd Street until 45th was available. Above are photos taken of the interview, which is part of an educational program series that will air next Fall. Yul, the winner of Survivor (Cook Islands in 2006) was my interviewer. He has degrees from Stanford and Yale Law so our conversation flowed (sometimes too much, so we had to do some retakes). He attributed his win on Survivor to his knowledge of and use of game theory -- now, how cool is that?! He has also worked for the Obama Administration as the deputy chief of the consumer and governmental affairs bureau for the FCC. We were filmed walking on Broadway in the area that has been closed to traffic since May 2009 and transformed into a pedestrian plaza. The sound and video crew were fantastic and allowed us to warm up in a Starbucks since it was cold. The entire "production" took about three hours. Now I can tell my students that they should really study because one never knows where your expertise will take you! The day after, the producer told me that the need to move the original site for our filming was because the Ashton Kutscher movie "New Year's Eve," was being shot on Times Square that evening. It's wonderful when some good news arrives and it is especially heart-warming when the good news is about our students! This week, we heard that one of my doctoral students in Management Science, Nathan Kollett, received a travel award of up to $800 so that he could attend the SBP 2011 Conference that will take place at the University of Maryland College Park, March 28-31, 2011. How wonderful that the organizers of this conference actually wrote grants in order to support student travel! As the Tutorial Chair of this conference, I must say that this support of students is simply fabulous! Also, another doctoral student of mine in Management Science, Min Yu, received notification that she has been accepted to take part in the 2011 POMS Doctoral Consortium that will take place in Reno, Nevada on April 30, 2011. The program for this consortium, which is one of the events at the POMS Conference, looks fantastic and is below. 4:40-5:00 Panel Session: Q & A. At the POMS Conference, Min will also be presenting one of our joint papers, "Multiproduct Supply Chain Network Design with Applications to Healthcare," which is co-authored with Dr. Patrick Qiang. In addition, another one of my doctoral students, Amir H. Masoumi, will be presenting the paper, "Supply Chain Network Operations Management of a Blood Banking System with Cost and Risk Minimization," at this POMS Conference, co-authored with Min and me. Both of these papers will be in the Healthcare Operations Management track. And, of course, our doctoral students in Management Science are busy this semester preparing for the First Northeast Regional INFORMS Conference that will take place at UMass Amherst, May 6-7, 2011. They are delighted that there will be an all-student panel at which some of the present (and previous) chapter officers of the UMass Amherst INFORMS Student Chapter will discuss how to run a successful chapter! We have seen a preliminary program for this conference and, I am a bit biased, but it is fantastic! Several of our doctoral students will be presenting their research at this conference. Researchers at Texas Tech's Center for Geospatial Technologies have developed what is a near-real-time map of the aftershocks occurring globally following the 8.9 magnitude earthquake that rocked Japan Friday. According to Reuters: Kevin Mulligan, the Director of the Center, said the map was developed since there was a lack of new information presented on major news outlets. The map connects to near-real-time remote feeds from the United States Geological Survey's Earthquake Hazards Center and the National Oceanic and Atmospheric Administration's Tsunami Warning Center. The map was constructed using Arc GIS and, according to Mulligan: "This map is a dynamic map surface that shows the distribution of recent earthquakes from a USGS live remote feed." It also has information about earlier earthquakes in the general area of Japan and allows you to view the information via different displays (topographic, street view, and others). The map is very informative and can be accessed here. We were given the link by a fellow Brown University grad and note that some of the best reporting regarding the evolving situation of the explosion at the nuclear power plant in northern Japan that was not cooled down sufficiently because of a system cooling failure post the earthquake is being done by Martin Fackler and Matthew L. Wald of The New York Times. Coincidentally, Matt is another Brown University grad. Their article on the Explosion Rocks Japan Nuclear Plant After Quake is a must-read. Being of Ukrainian heritage, I pray that the Japanese do not experience the same catastrophe as we did in Chernobyl. The Japanese have suffered enough. The devastation in Japan post the 8.9 earthquake and subsequent tsunami is severe (although it seems, for the most part, that Hawaii and the western part of the US have been spared). Companies with operations in Japan met post the earthquake to assess the damage. According to The New York Times, In the immediate aftermath, most companies evacuated and closed plants. Some injuries and some damage to factories have been reported, but the unknown for many operations could be the effect on supply chain operations and on the ability to receive parts and ship finished goods. Cargo shippers reported that major Japanese ports were closed, though the shutdowns may be precautionary. The country’s major seaports, most of them south of Tokyo, play a crucial role in Japan’s export-driven economy. Japanese exports — chiefly automobiles, machinery and manufactured goods — rose by almost 25 percent in 2010, the first increase in three years, and a lengthy shutdown could create costly delays up and down the global supply chain. Several airports, including Tokyo’s Narita, had been closed. Recently, Dr. Patrick Qiang and I revised our paper, "A Bi-Criteria Measure to Assess Supply Chain Network Performance for Critical Needs Under Capacity and Demand Disruptions ," which we had submitted to a special issue of a transportation journal on Network Vulnerability. The paper provides a model for supply chain disruptions in which capacities on various links from production to storage and transportation are affected due to disruptions (all of which is happening now post the disaster in Japan). The objective is to minimize the total network costs, which are generalized costs that may include the monetary, risk, time, and social costs. In this paper, we consider two different cases of disruption scenarios. In the first case, we assume that the impacts of the disruptions are not as severe and, although there are capacity reductions, the demands for products can still be met. In the second case, the demands cannot all be satisfied. For these two cases, we propose two individual performance measures. We then construct a bi-criteria measure to assess the supply chain network performance for critical needs (products that are needed in disasters, specifically). I started this blog over two years ago for several reasons, and am now experiencing a case of deja vu. One of the reasons was that my co-author Dr. Patrick Qiang and I had finished our Fragile Networks book and with so many disasters occurring in the world, I thought it important to have relevant research disseminated and discussed. Plus, students and colleagues had been providing gentle pressure that I start a blog and it would serve as a good forum for commentary. Also, my daughter was at the Bement School in 9th grade then, and her class was about to embark on a trip to the Dominican Republic to assist in an orphanage there and I thought it would be interesting to share some of their experiences after their return. Who would know that less than a year afterwards a major earthquake would hit Haiti, which shares an island with the Dominican Republic. Moreover, she will soon be off on another community service trip. Also, Dr. Qiang and I, based on a tutorial that I gave on the subject of Fragile Networks at the ALIO-INFORMS conference in Buenos Aires, Argentina, wrote a summary of some of the highlights in our book, and the article is now in press in the International Transactions in Operational Research. Our work has been applied to assess infrastructure vulnerability, especially in the context of critical infrastructure, including transportation, in various countries. Will a Tsunami Hit and, If So, Where? Many of us in the Northeast awoke to the news of the earthquake that struck northeastern Japan, making it the largest earthquake to ever strike the country and the fifth largest ever recorded in the world since 1900! The massive earthquake was registered at a magnitude of 8.9. President Obama was awoken at 4AM this morning due to tsunami warnings, with Hawaii, the west coast of the US, Latin and South America on alert. The warning has been lifted for New Zealand but initially 50 countries were notified about a potential tsunami. The images from Japan have been striking with boats and vehicles being swept by massive waves, as well as houses, and the infrastructure collapsing. The buildings swayed in Tokyo, which is over 200 miles from the earthquake's epicenter, with airports closed, communications down, the high speed trains at a standstill, and fires raging in the northeast of the country. Luckily, the nuclear power plants were shut down automatically. Japan has an extensive, well-thought out building code, from lessons learned after the Kobe earthquake. When I saw the news early this morning I immediately contacted my colleagues in Hawaii, a former student whose family lives in Japan (he just sent me a message that they are alright), and I even have a colleague at UMass Amherst who is scheduled to fly for spring break today to Costa Rica, another country where the alert has been sounded, not to mention Chile (which had an earthquake just last year and a tsunami warning), Colombia, and Peru. My last email correspondence last night was with a colleague in New Zealand so I breathed a sigh of relief that the tsunami warning has been lifted there since this country had its own recent earthquake that devastated Christchurch. And my colleague from Hawaii just wrote to me: Anna: Thanks for your kind thoughts. Waves are beginning to hit the shoreline right now, and we should have a clearer idea soon of what kind of magnitude to expect. We will have to wait, watch, and see what happens over the next several hours. We are a global community so when disaster strikes the impacts propagate. Let's hope for the best. Armchair generals talk strategy. Real generals talk logistics. Rich Karlgaard, the publisher of Forbes magazine, recalls this saying in his outstanding column on Innovation Rules: Ten Tips: Restructuring Winners, in which he identifies what elements will help corporations in the great restructuring, which necessarily follows a great recession. Frankly, there is a lot of relevance in his excellent advice to other organizations, including universities. He identifies successful companies such as: FedEx, Southwest Airlines, Microsoft, Apple, Genentech, SAS, and Oracle, which were started during the "rotten decade of the 1970s," during which IBM also managed to flourish. PICK A LEADER IN ANY FIELD AND YOU'LL FIND SUPERB LOGISTICS AND SUPPLY CHAINS UNDERNEATH. He singles out Wal-Mart and Amazon.com for their superior logistics. As for the remainder of his tips, they round out what are fundamental to the success of corporations and organizations, alike. He advises to seek out the best talent, and quotes Bill Gates as stating that a great programmer is worth ten thousand times the price of only a good programmer. What really resonated with me, as well, was his emphasis on the importance of both internal and external communications (with IBM being a model for the latter and the military for the former). Excellent communications is one of my "pet peeves," and I wonder how much we have lost in the realization of the full potential of organizations because some of those "in command" did not provide the necessary information and did not get the important news disseminated. Karlgaard ends by noting that integrity is essential and that everyone should know your purpose (see, it's about communication, here, too). I'll skip one of his tips -- branding, and will leave that to my marketing colleagues. And, as for logistics, one of my undergrad students, who took my Transportation & Logistics class last term stopped by my office yesterday to seek advice because he wants a job in this industry, since logistics is his passion. I am sure that he will succeed. If you wish to learn more about logistics and supply chains, please come to our Northeast Regional INFORMS conference at UMass Amherst, May 6-7, 2011. Information on a relevant tutorial at this conference is below. President, INFORMS Military Applications Society. Alan L. Leshner, the Chief Executive Officer of the American Association for the Advancement of Science (AAAS), wrote an excellent commentary in the latest issue of The Chronicle of Higher Education, entitled: "We Need to Reward Those Who Nurture a Diversity of Ideas in Science." In his commentary, he argues that, by increasing the diversity of the scientific human-resource pool, we will inevitably enhance the diversity of scientific ideas, since, by definition, innovation requires the ability to think in new and transformative ways. Moreover, many of the best new ideas come from new participants in science and engineering enterprises, from those who have been less influenced by traditional scientific paradigms, thinking, and theories than those who have always been a part of the established community. I completely agree with Mr. Leshner that we need to enhance diversity in terms of the inclusion of women and minorities, and reading his thoughtful piece truly brightened my day since it shows that others recognize the need. I would, however, add that we also need to break up disciplinary silos and to work on creating diversity across disciplines, and only then, will we be able to, as President Obama stated in his State of the Union address (coincidentally, I was in DC then for the Transportation Research Board (TRB) meeting), "out-innovate, out-educate, and outbuild the rest of the world." Indeed, creativity is found everywhere and needs to be nurtured. Finally, as Leshner so well elucidates, universities need to recognize faculty that work on increasing participation in science and engineering and even notes that universities should also pay tribute to such faculty through public acknowledgment of such successes through press releases, articles in university publications, etc., to send a clear message of support. Personally, working with a diverse body of students is the greatest reward since we all learn so much from one another -- how boring the world would be if there was perfect homogeneity! Three Fabulous Plenary Speakers Confirmed for the Northeast Regional INFORMS Conference! Dr. Brenda Dietrich of IBM, who will speak on a Smarter Planet. Dr. David Simchi-Levi of MIT, who is also the Editor of the flagship journal, Operations Research, who will be speak on Flexibility--From Practice to Theory. The panels for this conference are also confirmed and I am delighted that there will be an all student panel. Please check out the conference website, since it is regularly getting updated. Both Dr. Brenda Dietrich and Dr. Sandy Pentland spoke earlier in our UMass Amherst INFORMS Speaker Series, so it will be terrific to welcome them back. I will be seeing Dr. Pentland even before then, since he is giving a tutorial at the SBP 2011 conference that will take place at the University of Maryland College Park at the end of this month. I am serving as the Tutorial Chair at this conference. And, as for a confirmed tutorial at our UMass Amherst conference, I am absolutely delighted that Mr. Greg H. Parlier, a retired colonel, will give the tutorial: Transforming U.S. Army Supply Chains: Management Innovation in DoD for Improved Efficiency, Productivity, and Cost-Effective Global Operations. This will certainly be a Spring with some wonderful conferences, which I will be blogging about, of course! Thanks to all the conference organizers and program committee members who devote so much time and effort to the organization of these important venues for researchers, practitioners, and students alike! Hope to see you at UMass Amherst in the beautiful month of May and even at the SBP 2011 conference before then, if your schedules permit! I never thought that I would be on an Italian radio program. Thanks to our session on Mathematics and Collective Behavior at the recent AAAS meeting in Washington DC, I was interviewed by a science journalist, Mr. Federico Pedrocchi, of Milan, Italy, who also taped our session. Mr. Pedrocchi has his own radio program in Italy that focuses on scientific subjects. His report on my presentation about User-optimized and System-optimized Travel Behavior and the Braess paradox aired last week and you can listen to it online. The segment on traffic is the second one in his report and it begins at about 3:55 minutes and runs until about 7 minutes. In the meantime, you can enjoy the Italian spoken. Of course, there are excerpts in English from my interview. More information on Mr. Pedrocchi and his science radio program is available here. Listening to the program made me miss Italy so I looked back at some photos I took in Rome on my last trip there and I reminisced also about the traffic experiences I had there! Luckily, both my husband and I have Italian colleagues so what we could not figure out will be translated for us soon. The New York Times has an intriguing article, "Armies of Expensive Lawyers Replaced by Cheaper Software," which quotes one of my colleagues in the Computer Science Department at UMass Amherst, Professor Andrew McCallum. The article states that thanks to advances in artificial intelligence, “e-discovery” software can analyze documents in a fraction of the time for a fraction of the cost. In January, for example, Blackstone Discovery of Palo Alto, Calif., helped analyze 1.5 million documents for less than $100,000. What I find intriguing is the use of software to identify such issues as "sentiment" and even "emotion" or strength of an individual's feelings about issues based on language in email messages. Abstract: The field of social network analysis studies mathematical models of patterns in the interactions between people or other entities. In this talk I will present several recent advances in generative, probabilistic modeling of networks and their per-edge attributes. The Author-Recipient-Topic model discovers role-similarity between entities by examining not only network connectivity, but also the words communicated on on those edges; I'll demonstrate this method on a large corpus of email data subpoenaed as part of the Enron investigation. The Group-Topic model discovers groups of entities and the "topical" conditions under which different groupings arise; I'll demonstrate this on coalition discovery from many years worth of voting records in the U.S. Senate and the U.N. I'll conclude with further examples of Bayesian networks successfully applied to relational data, as well as discussion of their applicability to trend analysis, expert-finding and bibliometrics. Joint work with colleagues at UMass and Google: Xuerui Wang, Natasha Mohanty, and Andres Corrada. Coincidentally, yesterday, I marched over across the UMass Amherst campus with one of my doctoral students to attend a talk in the Computational Social Science Speaker Series, which is a new initiative here at UMass Amherst. The speaker was Dr. James Kitts of the Graduate School of Business at Columbia University and he spoke on "Group Processes and Local Network Dynamics." He brought up some fascinating issues, which would be challenging, but intriguing, to model. I very much appreciate how analytics and computer science are making an impact on so many different disciplines. What if Noone Showed Up to Your Talk! Academics harbor different fears, a topic, which of itself, would merit a series of blogposts. When an academic gives a seminar or speaks at a conference and has spent a lot of time not only doing the research that she is to speak on, not to mention all the time it takes to prepare a well-thought out and engaging presentation, she would welcome a good audience. By a "good" audience, I mean an attentive one, and one of a decent size. John L. Jackson Jr., writing in The Chronicle of Higher Education, has a most vivid rendition of a talk that he gave 10 years ago to which noone showed up except for the speaker (John, that is) and the person that invited him. And there were fliers posted up that he could even see. The article made my heart bleed for him. In the article, he argues whether we have simply too many seminars (and, perhaps, folks are too busy) to attract a good-sized audience. He does note, however, that student-organized events, including talks and seminars, tend to draw a large audience. Indeed, this is the strategy that we have been using for the past seven years or so, when we organize seminars as part of the activities of the UMass Amherst INFORMS Student Chapter. As this chapter's Faculty Advisor, I have over the years only missed about two out of seventy plus seminars (I even traveled back from Harvard during my sabbatical in 2005-2006 while I was a Fellow at the Radcliffe Institute for Advanced Study to support the students and the speakers). In an earlier post, I wrote about how to organize a great speaker series and related issues (and, clearly, part of it is to attract a terrific audience, since, otherwise it is insulting to the speaker). Folks regularly tell me how wonderful our speakers are and that their talks on Fridays are the highlights of both students' and faculty members' weeks! We've even had TV news crews show up to interview some speakers, but we strategize well and disseminate the talks really well. The students do an outstanding job in hosting and following up with thank yous. We have now started a "Meet the Executive" series, which is attracting students (grad and undergrads), faculty, and others from throughout campus. I remember, on a related matter, a New Year's Eve party that my husband and I were invited to back in our Brown University days. It was organized by two physicists and my husband ended up being the only invited guest to show up. Today's Boston Globe has a wonderful article on analytics and the role that quantitative modeling and data analysis are playing in sports. The article quotes Professor Steven Graves (well-known to us in operations research / management sciences) of the Sloan School at MIT. The article also notes that women are playing an increasing role in analytics in sports and, according to Patriots VP Jessica Gelman, analytics has helped level the field for women in pro sports. As you may (or may not) be aware, the Isenberg School at UMass Amherst this year named its sports management department the Mark H. McCormack Department of Sport Management, after the founder of IMG, and we inherited his volumes of correspondence, and a sports historical legacy that is unparalleled. The media coverage of this fantastic news continues to this day. Analytics is capturing the imagination of students, researchers, and business practitioners and at the Isenberg School, research is conducted on a wide spectrum of areas and I find the interdisciplinarity and multidisciplinarity nature of it fascinating and intellectually invigorating. The Isenberg School is now home to 7 departments, from the "classical" ones such as the Accounting, Marketing, and Management Departments, to my Department of Finance and Operations Management, and the more recently added, Department of Hospitality and Tourism Management and the Resource Economics Department, in addition to our named Sports Management Department. There is terrific research taking place with analytics at its underlying core and you can view a summary of our scholarly publications, books, and grants received on our website. From research on supply chain network design to transportation operations to efficiency in hotels to a variety of sustainability issues and sports team performance as well as hedge fund failure and risk measures, it is clear that research at business schools is going deeper and broader through analytics, and is transforming practice!